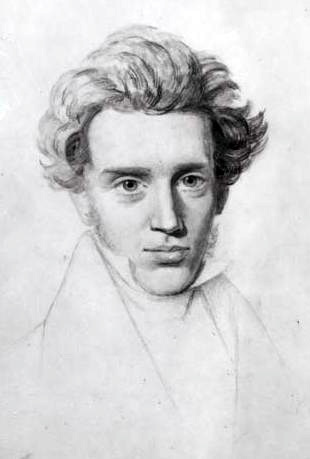 Sketch of Søren Kierkegaard. Based on a sketch by Niels Christian Kierkegaard (1806-1882). Public Domain via Wikimedia Commons. In Catholic Theology, the traditional definition for faith comes from the Bible: “faith is the assurance of things hoped for, the conviction of things not seen” (Hebrews 11:1 NRSV). This firm yet unseen hope characterizes the goal of the Catholic faith, which is communion with God and each other. This communion takes the form of friendship and involves publicly reasoning—believing and knowing—about the object or goal of this faith. Now, the truth to which one intellectually assents is not initially apparent to everyone in plain sight but is discovered as intelligible and credible because the God who has revealed it is trustworthy. Thus, the knowledge of God that is received and believed by faith at once invites and resists intellectual mastery. In St. John Paul II’s encyclical Fides et Ratio, he commends Kierkegaard to his readers (n. 76). For John Paul II, Kierkegaard understood the epistemic humility that is required when contemplating the God who is revealed intelligibly as mystery: “the knowledge proper to faith does not destroy the mystery; it only reveals it the more, showing how necessary it is for people’s lives” (n. 13). Thus, the light of faith that shines in the dark is paradoxical: the mystery of faith that is believed is also the faith by which one believes. Yet, faith is often misunderstood as if it was a technological apparatus like night-vision goggles. Instead, the Bible speaks of faith as coming from a word that is heard: “faith comes from what is heard, and what is heard comes through the word of Christ” (Romans 10:17 NRSV). Faith requires the patience for one’s eyes to adjust to the dark so that one may hear and see God’s self-disclosure to humanity—like the solar illumination of the moon, faith is lit up with borrowed light. “From your hand, O God, we are willing to receive everything. You reach it out, your mighty hand, and catch the wise in their foolishness. You open it, your gentle hand, and satisfy with blessing everything that lives. And even if it seems that your arm is shortened, increase our faith and our trust so that we might still hold fast to you. And if at times it seems that you draw your hand away from us, oh, then we know it is only because you close it, that you close it only to save the more abundant blessing in it, that you close it only to open it again and satisfy with blessing everything that lives. Amen” (EUD 31). “In a human being’s relationship with God, it is inverted: the more he needs God, the more deeply he comprehends that he is in need of God, and then the more he in his need presses forward to God, the more perfect he is” (EUD 303). To sum it up briefly, Kierkegaard’s view of the Christian faith is informed by Scripture. For Kierkegaard, despite one’s circumstances in the dark, faith is a humble trust in the goodness of God who says “See, I am making all things new” (Revelation 21:5 NRSV). Featured Image Credit: “A candle for a prayer” by Brendan Ross. CC BY-SA 2.0 via Flickr. Joshua Furnal is Assistant Professor of Systematic Theology at Radboud University in the Netherlands. He holds a Ph.D. from Durham University (England). 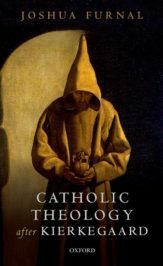 He is the author of Catholic Theology after Kierkegaard. Currently, he is working on a project at the intersection of Existentialism and Thomism during the twentieth century. Love Kierkegaard, but in going through my tough times, I prefer faith in my own resourcefulness. No need to worry about being in the dark if it is never dark inside your head.